The ten volume set “Records of the Colony of Rhode Island and Providence Plantations in New England” was compiled in the mid-1800’s by Rhode Island Secretary of State, John Russell Bartlett. 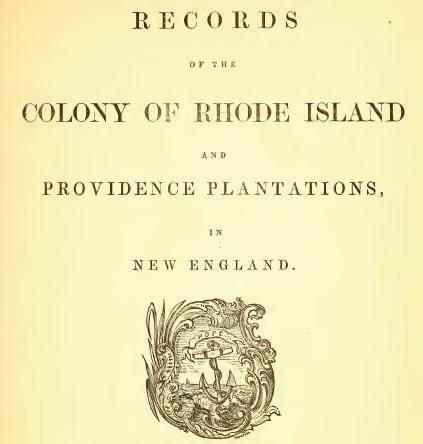 Title page from Records of the Colony of Rhode Island, volume 1. Originally settled in the 1630’s as four settlements (Providence, Newport, Portsmouth, and Warwick), the idea that Rhode Island would or should be a single colony came about in the next decade. These books contain the records of the colony through 1792, when the U.S. Constitution was ratified and Rhode Island was, officially, no longer an independent entity. Compiled from a variety of sources (sometimes town records, or records from nearby states, were needed to replace missing or damaged portions), the records are, of course, incomplete. They begin with the earliest town records, starting in 1636. The books provide a fascinating window into the formation of a new kind of government and the large and small concerns that arose along that journey. For genealogists, each volume contains an index at the back. The books are remarkably readable; spelling (but not language) is somewhat modernized. Random quotes appear after the link to each pdf volume, below. Records of the Colony of Rhode Island, Volume 1 1636-1663 Will download directly from Internet Archive – archive.org. [p. 430] It is ordered, that Mr. Richard Smyth, Sen’r, Mr. William Feild, Mr. William Carpenter, and Mr. John Weekes, are authorized to consider some way of makeinge a bridge over Pawtuxett river, and present their result and agreement thereon unto the next Court of Commissioners. Records of the Colony of Rhode Island, Volume 2 1664-1677 Will download directly from Internet Archive – archive.org. Records of the Colony of Rhode Island, Volume 3 1678-1706. Will download directly from Internet Archive – archive.org. [p. 277] Voted, In answer to the petition of the town of Warwick, complaining that they are over-rated, but are willing to pay their equal proportions, the Court having seriously considered the matter, do find that the manner of rating of towns by guess is no suitable nor certain rule, but may prove very prejudicial; and therefore do determine that for the future, all rates that shall be made in this Collony, shall be made according to so much on the pound as the estates of persons are valued at. And for the better offecting of the premises, it is desired, that betwixt this and the next Court in October next, to be held at Providence, that any of the members of this Court would draw up some rule for appraising of lands or cattle, to be valued, to know mens’ estates by, and in order for the Court to give their determination, and in case upon examination of the matter, it doth appear that any town in this Collony hath been by guess over-rated, at the meeting of the Commissioners then it shall be abated out of the next proportionally. Records of the Colony of Rhode Island, Volume 4 1707-1740 Will download directly from Internet Archive – archive.org. [p. 206] Be it enacted by this present Assembly and by the authority it is enacted, that what maintenance or salary may be thought needful or necessary by any of the churches, congregations or societies of people now inhabiting, or that hereafter my inhabit within any part of this government, for the support of their, or either of their minister or ministers, may be raised by a free contribution, and no other ways. Records of the Colony of Rhode Island, Volume 5 1741-1756. Will download directly from Internet Archive – archive.org. [p. 58] Be it enacted by the General Assembly of this colony, and by the authority thereof it is enacted, that the town of North Kingstown, in the county of Kings county, be divided into two towns, by a line beginning at the south side of said town, at the middle of the highway that runs between the farm, now or late of Jeoffry Hassard and the farm of Eber Shearman, to extend from thence northwardly, to the extent of said highway, as the same runs northwardly ; and from the middle of said way, where it meets the cross highway, to extend northwardly, in a straight line, to meet the highway that runs between the land of William Hall and Christopher Spenser j and from thence, to extend northwardly, as said highway, runs to East Greenwich south line ; and that the eastward part of said town retain the charter and name of North Kingstown, and the western part to be called by the name of Exeter, and be incorporated into a township ; and to have and enjoy the like, privileges with other towns in this colony. Supplement to The Records of the Colony of Rhode Island, Comprising A List of the Freemen Admitted from May, 1747 to May, 1754. Will download directly from Archive.org. Records of the Colony of Rhode Island, Volume 6 1757-1769 Will download directly from Internet Archive – archive.org. [p. 141] FREEMEN ADMITTED: Westerly—Jona. Foster, James Babcock, Jr., Christ. 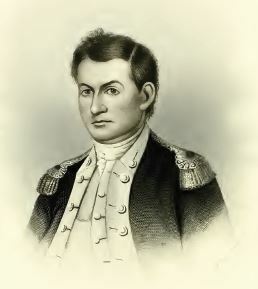 Babcock, Robt. Burdick, Jr., Josh. Babcock, Jr., John Bliven, John Bliven, Jr., Isaac Varse, Jr., William Vinsent, William Bromley, Samuel Pendleton, Charles Hall, Stephen Gavit, Henry Babcock, Henry Mulkin, Isaac Hall, Thomas Ross and Abraham Lewis. North Kingstown—John Congdon, Jr., Rouse Northup, Stukely Westcoat, Frederick Phillips, John Reynolds, tailor; Christopher Fowler, Jabez Reynolds, Jr. ; Samuel Fones, James Northup, John Sweet, son of Benjamin ; Thomas Rathbone and Eber Sweet. South Kingstown—Enoch Haszard, Daniel Shearman, Jr. and Elisha Watson. East Greenwich—Pardon Tillinghast, Samuel Vaughan, Benedict Hambelton, John Wightman, son of James ; Elvin Briggs, Samuel Tarbox, son of John, Thomas Wells, Abraham Greene, Caleb Lawton, Benjamin Bennett and Henry Straight. Jamestown—John Weeden. Smithfield—Jeremiah Smith, Jr., Obadiah Herenden, Peter Teft, Jr., Jonathan Gulley, Ahab Wilkinson Noah Smith, Jeremiah Phillips, James Teft, Eliezer Brown, John Farnom, Chas. Angell, John Austin, Benjamin Whipple, Richard Harris, Jr., Arnold Pain, Uriah Harris and Samuel Comstock. Records of the Colony of Rhode Island, Volume 7 1770-1776 Will download directly from Internet Archive – archive.org. [p. 421-2] Whereas, Mr. Joseph Farrish preferred a petition to this Assembly, setting forth that on the 27th of November last, he was taken up by order of Col. Richmond, upon a suspicion of his having served the King’s ships, stationed at Newport, with beer, and of being unfriendly to the the American cause ; and after being had before the committee, was committed to jail, where he has remained ever since. Records of the State of Rhode Island, Volume 8 1776-1779 Will download directly from Internet Archive – archive.org. [p. 407] Bills Ordered to be Paid. Records of the State of Rhode Island, Volume 9 1780-1783 Will download directly from Internet Archive – archive.org. It is therefore voted and resolved, that the sheriff of the county of Kent be, and he is hereby, directed to convey the said Nicholas Spink and John Underwood on board the first vessel which shall sail for New York or Long Island. 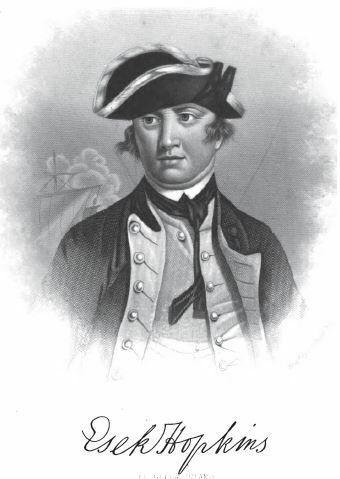 Colonel Christopher Greene (third cousin to another Rhode Island Revolutionary War officer, Nathanael Greene) was killed by Loyalist forces in 1781 — portrait from fontispiece, vol. 9. Records of the State of Rhode Island, Volume 10 1784-1792. Will download directly from Internet Archive – archive.org. [p.503] It is voted and resolved, that Peleg Arnold, Esq., Thomas Holden, Esq., Job Watson, Esq., Robert N. Auchmuty, Esq., Mr. Charles Lippitt, George Thomas, Esq., Mr. Charles Wheaton, Hopkins Cooke, Esq., and the secretary, be, and they are, hereby appointed a committee to receive and count the proxes put in by the freemen, for the representatives of this state in the Congress of the United States; and that they make report to this Assembly as soon as may be. Documentary History of Rhode Island, Volume 1. 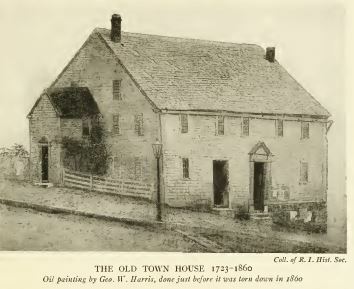 Being the History of the Towns of Providence and Warwick To 1649 and the Colony to 1647, by Howard M. Chapin (1916). Will download directly from Archive.org. Documentary History of Rhode Island, Volume 2. 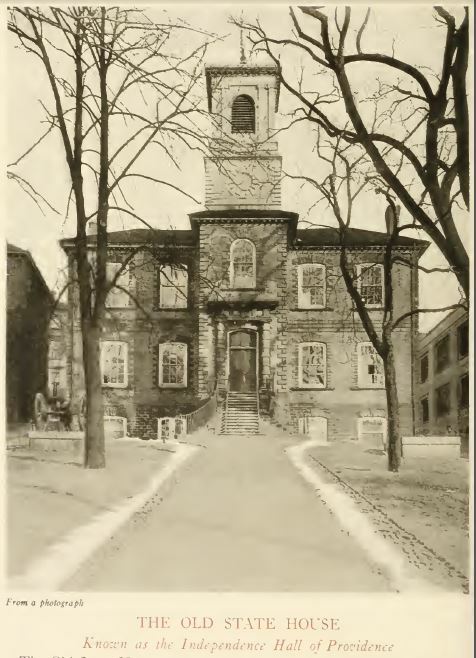 Being the History of the Towns of Portsmouth and Newport To 1647 and the Court Records of Aquidneck, by Howard M. Chapin (1919). Will download directly from Archive.org. P.S. I use Safari and have opened a couple of your links with no problem at all. Good morning. Love your blog. I find so many great things here. I tried to open the links you posted this morning and they say they are broken. Am I the only one having trouble with this? Also, I am looking for an Oath of Alligience that would of been taken between 1775-1783 in the towns of Richmond and Glocester. Do you have any idea where I might look? I have contacted RIHS and they don’t know. I am looking for tax rolls from that time period also. Hi Vickie. thanks for your comment. I have tried the links from two computers, using a Firefox browser, and I’m not having a problem. Can you try a different browser? About the Oath of Allegiance, unfortunately I am not a R.I. History expert. The only thing your question brings to mind is a book about Providence called “Providence Oath of Allegiance and Its Signers, 1651-1652”; there is an Amazon listing for that here: http://www.amazon.com/Providence-Oath-Allegiance-Signers-1651-1652/dp/0917012461 however I know nothing about that topic as it may relate to Richmond and Gloucester. Sounds like a good thing to search for in a couple of volumes that I’ve posted today. I hope the downloading problem is solved.